There are so many stories of adventure. 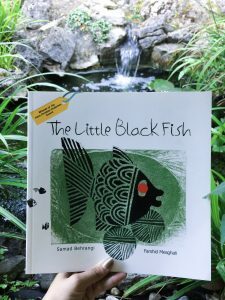 Children’s books paint the image of a world ready to be explored, and Samad Behrangi’s The Little Black Fish is no exception. It tells the story of a brave little fish who is full of big questions, and is determined to find his answers and follow his dreams. A beloved story that has lasted for 50 years, it carries important messages about life and bravery that everyone can learn from. In his little stream, nobody asks questions. Things are the way that they are, and everyone has to follow along with it. This little fish dares to fight against that idea, to question what else could be out in the world, and goes out to actually see it for himself. It is easy for anyone to see themselves in this story, whether we are swimming along with the other fish or daring to be different. Perhaps the most inspiring part of the story is the bravery of this little fish. From him we learn that there is not just one way that somebody can be brave. There is the bravery to explore alone, to stand up to others for what you believe in, and the courage to help others, at no benefit to yourself. The little black fish is ready to face the risks and dangers that come his way, because he wants to follow his dreams. We can ask ourselves what we could achieve if only, like this little fish, we were brave enough to not worry about what others think and leave our comfort zone. The Little Black Fish shows children that they do not have to think inside of the box, but instead should ask questions, be brave and explore what is around them. But as much as this book can teach children, it has a message to share with adults as well. It can teach us that that we can always question and disagree with the ignorance of others, and that it is more important to do what is right than it is to do what is expected of us.